As of October 2018, Bob Blackmon is now represented by a second gallery in Ireland— The Half Light Gallery, 97 Main Street, Midleton, County Cork. Important exhibiton coming up in the fall, cosponsord by the Irish-Amrican Heritage Museum and The Halflight Gallery: "I Am of Ireland: The Work of an Honorary Irishman (Bob Blackmon) and other Irish Artists.” See Exhibits in U.S., below, for more details. of recent and older paintings. Gallery 5 contains images of greeting cards, described below. Gallery 6 exhibits sample paintings by my students. The final two pages of the site consist of the Links to other Interesting Websites and the Contact The Artist Page. Signed and numbered, museum-quality giclée prints are available for many paintings, as indicated under the painting’s image in the various galleries. Blank, fold-over greeting cards are currently available for the following paintings: Red Truck, Pure Pleasure, New York Maple, and Winter Morning. Cards are 5 x 7 inches and are suitable as greeting cards or for framing. See Gallery 5. Colonie Art League March Exhibit, Willian K. Sanford Library, Colonie, New York, March 3 to 31, Reception: March 10, 5 to 7 pm. Still Life Works of Bob Blackmon at the Clifton Park Library— a solo show. 475 Moe Road, Clifton Park, New York 12165, July 1 to 30. I Am of Ireland: The Work of an Honorary Irishman (Bob Blackmon) and Several Irish Artists, East Greenbush Community Library, November 1 to 30. Reception: November 10, 2 to 4 pm. Irish poetry will be read at the reception. This show is cosponsored by the Irish-American Heritage Museum in Albany, New York and The Half Light Gallery in Midleton, County Cork, Ireland. Once the show closes at the library, it will be moved to the museum for another month-long exhibition. The Irish artists include, Pat Hennessey, Paul Henry, Padraig McCaul, Brigid Shelly, Bernnie Power, Breda O’Brien, Rod Coyne, Rick Joyce, Matthew Ind, Margaret Cunningham, Janet Shaughnessy, and Vanda Luddy. The show's title, “I Am of Ireland,” comes from a poem with the same name by William Butler Yeats. This will be a very special event; all are invited!! Bob Blackmon at the Ardmore Gallery, Main Street, Ardmore Gallery, County Waterford, Ireland, Ongoing Exhibit. Blackmon originals can also be seen on dailypaintworks.com/Artists/bob-blackmon-4057 Thousands of artists from around the world are on that site. It is very interesting; check it out. - All dimensions are in inches. - Two sizes in the caption for a single image, for example, 11 x 14/16 x 20, means that an 11 x 14 stretched canvas is mounted on a 16 x 20 canvas board. For an interpretation of this painting click here. Then click on the upper part of this painting on that page. As a lifelong admirer of the Baroque painters, I paint realistically, emphasizing the contrasts between lights and darks, highlights, reflections, strong shadows, and usually dark backgrounds. My paintings are colorful, dramatic, and representational, though not photographic. Most of my paintings are still life. I enjoy bringing often-over-looked, everyday items to life in new and exciting ways. In fact, my art is really an attempt to find and reveal the beauty in life’s ordinary things. Old kettles and crockery, candlesticks, or a modern, gleaming glass vase are good examples. In addition, I’m striving to contribute to the revival of societal interest in still life art. 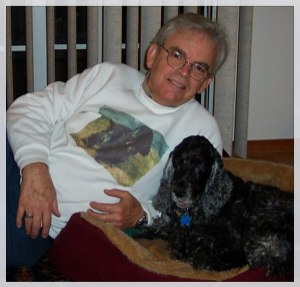 Retired from a career in higher education, Bob Blackmon lives and paints in Troy, New York. He has been painting since 1973, having studied under master artists Bob Tompkins (Madison, Mississippi) and the late Bill Zaner (Boerne, Texas). 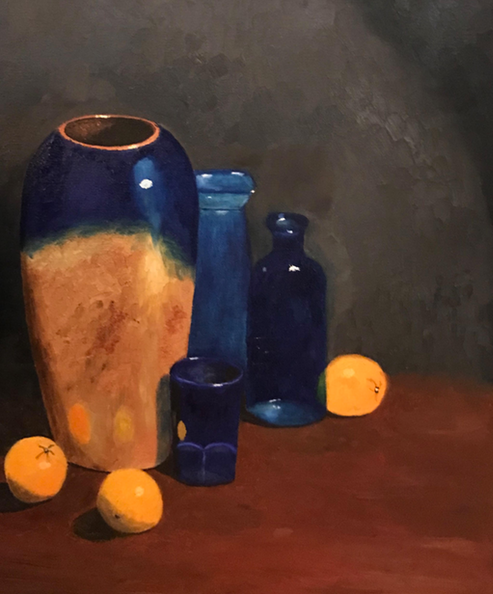 Blackmon’s still life style is influenced by the Baroque-style paintings of Tompkins, whose work is greatly influenced by that of the French artist, Jean-Baptiste-Simeon Chardin. Prior to his retirement in 2005, Blackmon held academic administrative positions at the University of Arkansas, the State University of New York, and Louisiana State University (where he received his PhD many years ago). In 1975, while a research scientist with the USDA Forest Service, he was also a Scholar in Residence at the Pakistan Forest Institute in Peshawar, Pakistan. Since their retirement Bob and his wife, Mary Beth, have become serious students of Irish history and culture and have made several trips to the Republic of Ireland. Bob Blackmon is a member of the Southern Vermont Arts Center, Bethlehem Arts Association, Colonie Art League, the Albany Artists Group, Schweinfurth Memorial Art Center, Saratoga Arts, the DeSoto Arts Council (in Louisiana, the state of his birth) and is one of three founding directors of the East Bank Art Alliance. He and Mary Beth are Sustaining Members of the Clark Art Institute in Williamstown, Massachusetts. Blackmon is one of the artists in the two galleries in Ireland-- Admore Gallery and the Half Light Gallery. He was recently juried into the organization, Oil Painters of America. Blackmon has exhibited his work at juried, non-juried, solo and group shows at Louisiana State University, in Gonzales, Louisiana, in Leland, Mississippi and Schenectady, Albany, Saratoga Springs, Colonie, Averill Park, East Greenbush, Port Ewen, Greenwich, and Troy, New York and Manchester Vermont. Venues have included the Sand Lake Center for the Arts, the Arts Center of the Capital Region, the Duck Pond Gallery, the Wine Bar and Bistro on Lark, the East Greenbush Community Library, the Villagers Stockade Show, Art in the Garden, the Pruyn House, the William K. Sandford Library, the Guilderland Library, the Art de Cure Galleries, Colonie Art League shows, and the Southern Vermont Arts Center. When not painting, traveling to Ireland, tending newly planted shrubs, being staff for two rowdy cats, Blackmon spends a fair amount of time as a human rights activist, something he has done intermittently since the Civil Rights Movement of the 1960s and 70s. Blackmon's paintings are original oils on canvas. Paintings in private collections are, of course, no longer available; the others are for sale. All works are nicely framed or on gallery wrapped canvas, wired, and ready for hanging. To reach the artist, use the Contact page. The artist reserves the right to reproduce his works and to market museum-quality prints. 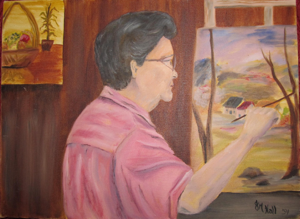 Reproductions of Blackmon’s paintings are made by Visual Winds Studio of Schenectady, New York. These are available as signed and numbered limited edition, museum-quality giclée prints. Disclaimer about photo quality: The very high quality images of paintings on this site were shot by professionals at Visual Winds Studio. Other photos of lesser quality were shot by the painter, and many will, in time, be replaced with professional photography. Bob Blackmon does a limited amount of teaching in the private lesson environment. Students spend several hours per day for a few mostly consecutive days studying and painting with the artist. At the end of the session the student takes a completed painting. Lessons are for adults only. No painting experience is necessary. Supplies are provided. See Gallery 6 for a few images of student paintings. To learn more about these private lessons, contact the artist at still.life.guy@gmail.com or 518.326.3212. The "Ireland Collection" (Gallery 3) is a separate gallery of paintings inspired by Irish subjects, such as landscapes, monuments, and pottery. Also, an Irish forest scene (photograph) is used for this site’s banner. And here is why: The forest shown is on the grounds of the Monastic community of Glendalough, one of the most peaceful and beautiful places on earth. For several years Blackmon has had works on exhibit at the Ardmore Gallery in Ardmore, County Waterford, in Ireland. Recently he was invited to exhibit in a second gallery in Ireland— The Half Light Gallery in Midleton, County Cork. He also has paintings in the permanent collections of several Bed and Breakfasts in the Republic of Ireland: Bracken B & B, Laragh, near Glendalough, County Wicklow; Newtown Farm Country House, Grange, near Ardmore, County Waterford; Four Winds Lodge, Galway, County Galway; and Windermere House, Castlebar, County Mayo. With sales from Ardmore Gallery in Ireland, and a sale directly to a collector in nearby Youghal, County Cork, Blackmon paintings are now in private collections in Ireland, Kenya, and Lithuania, as well as the Republic of Ireland and throughout the United States. 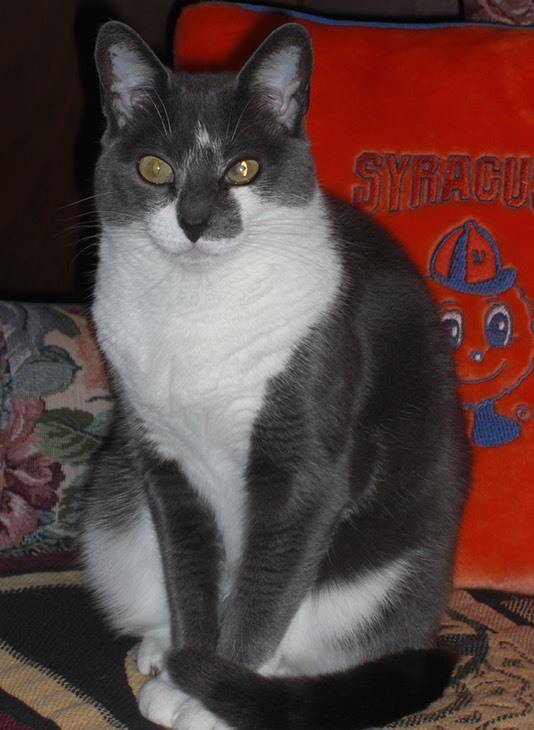 This site is dedicated to the loving memory of the magnificent and wonderful cat, Clare Blackmon (2007-2016) and Samuel Windermere Blackmon (1991-2006), a handsome English Cocker. Both were, and still are, intergral members of the Blackmon family and contributed enormously to the artist’s mental and emotional well being. Thus, they assisted and inspired the artist as he created many of the paintings on this website. 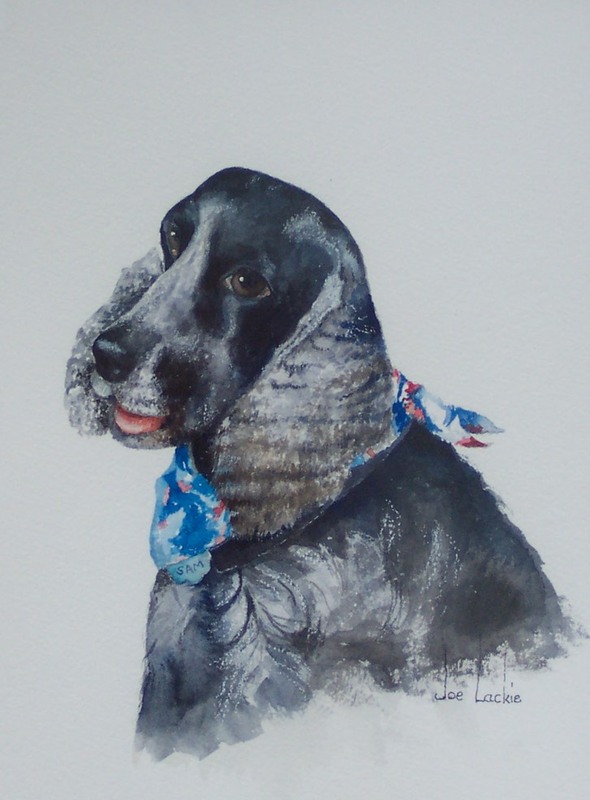 A beautiful watercolor portrait of Sam (below) was done by the late Baton Rouge artist, Joe Lackie. The artist pays special tribute to his sister, Ima Jeane Blackmon Cash (1929-1995), who was a gifted painter, and to his mother, Myrtie Wiggins Blackmon (1907-1993), who, inspired by her daughter and perhaps her son, created one painting in her lifetime. Likewise, the artist’s dear aunt, Gracie Smith (1921-2011) created one painting.